From the Ashbourne News Telegraph. 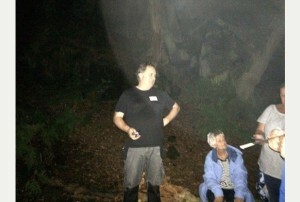 Giant orbs of light have been captured on film during a paranormal investigation in Shining Cliff Woods, near Ambergate. The footage was taken by Haunted Company, a paranormal investigation company from Wirksworth. Andrew Elson the founder of Haunted Company said: “I have never in my life seen or captured orbs this big on a photograph before. “At the time the images were being captured the paranormal activity was exceptionally high, our electro-magnetic field meters were off the scale and several members of the team felt presences close to them. “This was an exciting and scary event”. The team at Haunted Company said they are excited about these photographs as they managed to capture several orbs in different directions at the location for a period of around five minutes. The team together with guest paranormal investigators said they also experienced voices being heard on iPad radios, alongside communication taking place through dowsing rods and pendulums. You Watch, You Decide. Are These Real Ghost Sightings? Is This an Image of Bigfoot?